Given the importance of visual elements in elearning, it’s interesting to note that many instructional designers rely heavily on text-based research at the outset of a project and then consider visual elements when the text-based content has been developed. 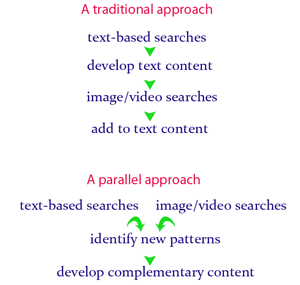 However, conducting text-based searches in parallel with media searches can allow you to find information and discern patterns that you might have missed with a traditional approach. In addition to searching the image and video collections of standard search engines, like Google and Bing, there are a number of search engines that create different visual outputs of a search. These can help you broaden your outlook on any given research topic. A particularly interesting display on Viewzi is the Photo Tag Cloud view which allows you to pan and zoom in on an image and word cloud to identify content of interest. 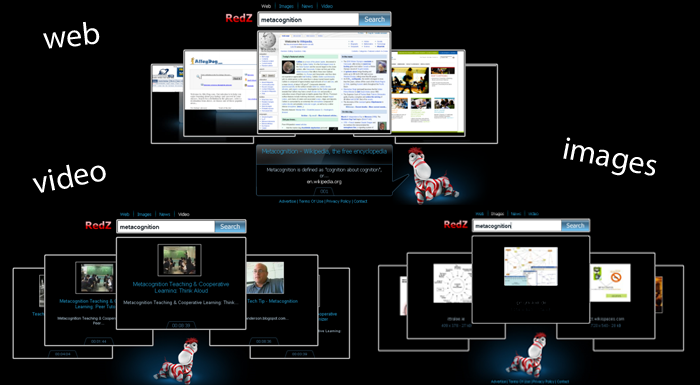 A RedZ search allows you to pan through a gallery of web screenshots, if you’re in Web view, to find relevant content. As you hover over a particular view, you’ll see a brief description of the content. You can readily toggle between views of Web pages, video, images, and even news. The SpaceTime 3D search engine also offers a gallery approach to viewing images and other content; however, the content displays are much larger. You use your arrow buttons rather than your mouse to move from one content element to another. SpaceTime 3D allows you to search Google, images, Wikipedia, and YouTube. TagGalaxy offers an interesting way to search Flickr images. Entering a tag, for example, “elearning,” reveals a galaxy of related search terms. (There aren’t all that many Flicker images about “metacognition,” believe it or not.) Selecting a particular search term creates a globe of Flickr images you can rapidly browse through to identify images of interest. 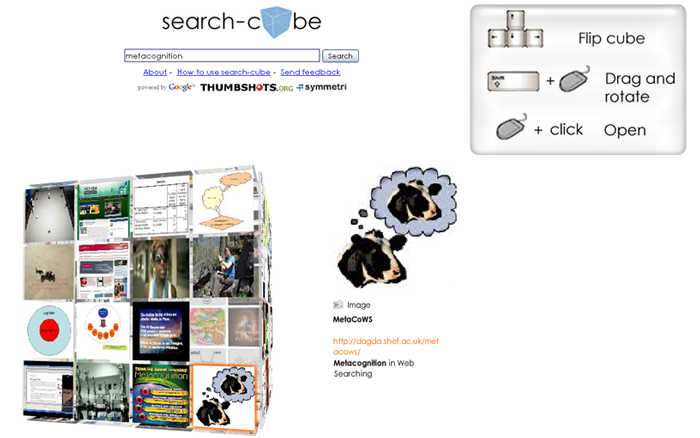 Search-cube offers a buffet approach to displaying search results. It presents you with a cube of content that you can move and flip. It mixes web pages, video, and image content on the cube. When you select content that interests you, you’ll see a larger image snippet of the content, a brief description, and a url. Click on the content image to see the web page associated with it. Spezify mixes search results up on a bulletin-board-like display, letting you see text, images, and video content, as well as content from social media sites such as Twitter. However, you can filter your search results to exclude certain types of media from your display. You can also bookmark and star favorite links using the spezify interface. I recommend trying out different search engines, in addition to the ones that output results using a traditional text display. It will help you develop assets for projects in a more natural way. It can also help you expand your perspectives of learning problems and their potential solutions. 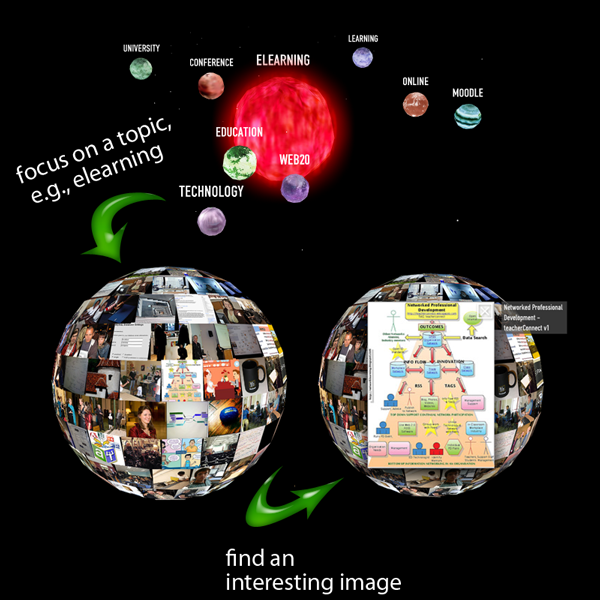 This entry was posted in graphical search engines and tagged elearning, graphical search engines, innovative search engines, instructional design, metacognition, redz, search-cube, spacetime 3D, spezify, tag galaxy, taggalaxy, viewz, visual search engines, visualization tools, Web2.0 tools. Bookmark the permalink.